In theory, investors should have one less thing to worry about with the passage of the federal spending bill last week, which averted a second government shutdown. However, true to form, investors replaced the fear of too little government spending with new concerns about too much government spending. Given that the bill’s passage coincides with the federal debt surpassing $22 trillion and now exceeding our country’s gross domestic product (GDP); the concern seems justified. In fact, The National Debt Clock personalizes the $22 trillion figure by reminding us that it equates to about $67,000 per US citizen, or roughly $180,000 per US taxpayer. As scary as the federal debt appears, we are less concerned for two reasons. First, in our opinion, there are several mitigating factors that make the debt-load less precarious than what is reported in the headlines. Second, the ‘warning lights’ that would typically flash before a debt crisis remain unlit. 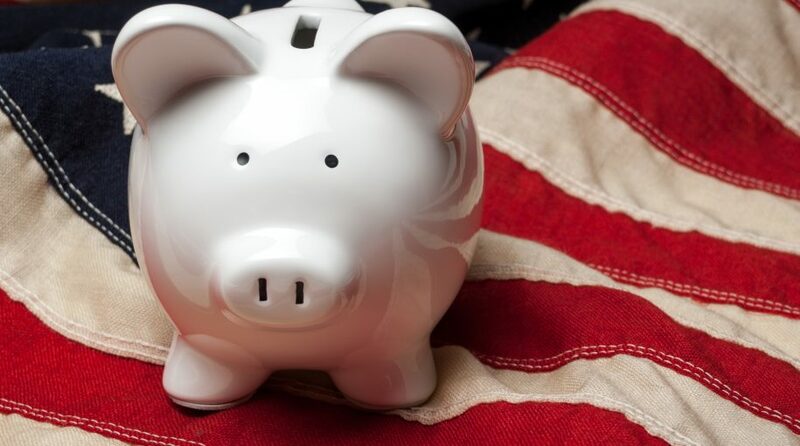 Intergovernmental Debts: According to the Congressional Budget Office’s (CBO) January 2019 report, roughly $5.5 trillion of the $22 trillion debt is intergovernmental debt. Intergovernmental debt is the debt that the government owes to itself. 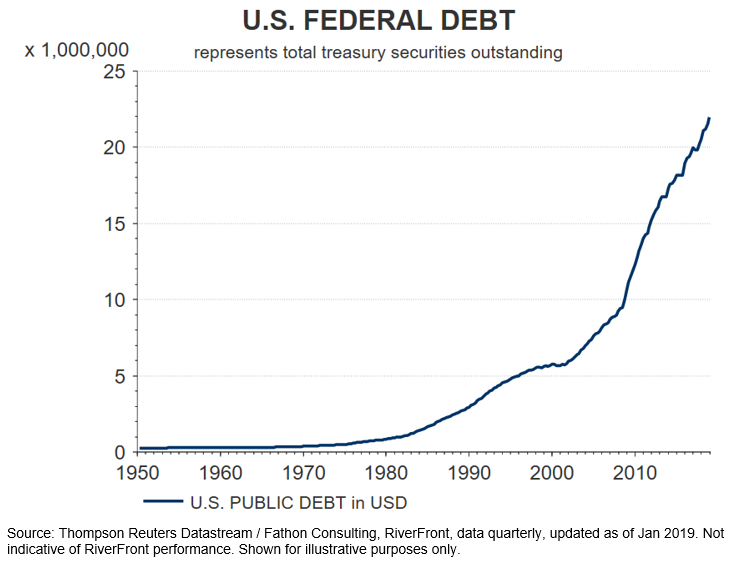 For this reason, many economists believe that ‘Federal Debt Held by the Public’, which excludes intergovernmental debt, is the more important measure of the Federal government’s indebtedness. By this measure, the federal debt is expected to grow to $16.6 trillion by year-end, which is about 78% GDP. While $16.6 trillion is a big number, it is 25% smaller than $22 trillion and well-below the psychological threshold of exceeding 100% of GDP. Sterling Collateral: Although it would be highly unlikely, if the US was obligated to put up collateral for its loans, there are plenty of assets it could pledge. A few of the ‘priceless’ assets it controls include prime land (national parks) and buildings, a portfolio of patents, usage rights to digital access, and spectrum and mining rights for energy and minerals. Printing Press: Lastly and most importantly, the Federal government has the ability to print its own currency, like it did in the years following the Financial Crisis. Since 2008, the Federal government printed over $2 trillion in US dollars and has the ability to print even more. In theory, no country with its debts denominated in its own currency should fail to make good on its debt obligations. US Dollar Plunges: Countries that have debt problems will also generally experience currency weakness. Foreign investors place less value on a currency that they believe is not supported by cash flow or assets, or will be diluted by printed money. Today, not only is the dollar not weakening, it is near multi-year highs relative to a trade-weighted basket of other currencies. When to Worry: Currency values move in cycles and the dollar is likely near the tail-end of a cyclical period of strength. Therefore, we would not be concerned about minor weaknesses in the dollar, in fact a little dollar weakness would be welcomed by US exporters and global investors. However, we would be concerned if the dollar began falling by more than 10% per year for several years. Inflation Spikes: Hyperinflation is another characteristic of economies experiencing a debt crisis. Stories of citizens using currency as wall paper (Weimar Republic of Germany) or needing wheelbarrows of cash (Zimbabwe and Argentina) to purchase basic household items are common in such economies. Currently, inflation in the US is at very modest levels and has recently been declining to around 2%. When to Worry: Significant levels of annual inflation of 10+% or more would cause the ‘warning light’ to flash. Long-Term Interest Rates Jump: Investors that are worried about reckless spending or large debt burdens will demand higher interest rates on borrowed money to compensate them for the risk of not getting paid back. Today, the interest rate on the 30-year US Treasury Bond is barely above 3% and is only 50bps (bps = 1/100th of 1%) higher than the rate on the 5-year note. When to Worry: The 30-year bond would need to rise significantly above current levels before we would start to get concerned. The level and growth of the Federal debt has irked investors for years. It has been a common touchstone for the ‘sky is falling’ crowd, and the passage of last week’s spending bill will likely serve as another reason to keep investors sidelined. We believe this is a mistake. We don’t see a debt crisis on the horizon and for this reason remain comfortable with buying US equities and holding US debt.